Get ready to play an exciting game that offers mobsters, robbers, and lots of money as you spin the reels in “3 Reel Hold Up” slots. This fabulous game from Wagerworks offers players the chance to bet up to five coins per line as they spin their way across the reels in hopes of triggering the two hundred coin jackpot or getting to the exciting bonus game. Each payout in the game is multiplied by the number of coins being bet per line, offering the chance for some very large and fantastic payouts to be won by lucky players. The fun graphics of this game are a take on classic comic books and offer such symbols as colored moneybags, mobsters, wild symbols, and bombs. The mobsters also frame the reels of these slots and the bonus game features an exciting armored car theme, with a number of safes and moneybags for players to choose from. With a jackpot of two hundred coins and a maximum bet of five coins per line, this game offers the chance to steal away with some mighty large payouts. 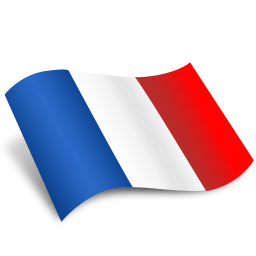 Wagerworks does not accept USA players - Click here for a list of casinos for US players. There are a total of three paylines on the three reels of this game. “3 Reel Hold Up” has clearly marked paylines running through the top, middle, and bottom of the reels in a horizontal fashion. While there is no autoplay feature in this game, there is plenty of action to keep players enjoying this game. There are a number of exciting payouts in “3 Reel Hold Up” slots, and it is possible to win on more than one payline in a single spin. The 200 coin jackpot is awarded when three wild symbols appear on a single active payline. Three purple mobster symbols pay out a total of eighty coins to the lucky winner, while three of the mobsters in the green suit are worth a sixty coin payout. Players who get three of the mobsters in the red suit on a single payline are awarded forty coins. Thirty coins are paid when three purple moneybags land on a payline, and three orange moneybags pay twenty five coins. Three mobsters of any combination pay six coins. 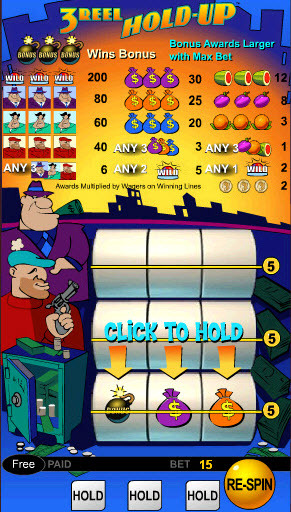 Each payout is multiplied by the number of coins bet per line, and the game offers a wild symbol, which can substitute for all symbols on the reels except for the bonus bomb symbol. Three bombs on a payline trigger the bonus game. In this feature, players find themselves looking into the back of an armored truck filled with bags and safes. Players are then allowed to choose one bag or safe to open and the amount inside is multiplied by the number of coins bet per line. “3 Reel Hold Up” slots offers players the chance to win large payouts while offering small bets and easy to read reels. This combination makes this game an excellent choice for new players and a continued favorite among slots veterans. Winning big is as simple as playing this excellent slots game!